The following dogs are available for adoption through GSRSV. Some are at the rescue ranch, some are in foster homes and some are with their owners or caretakers working with GSRSV. 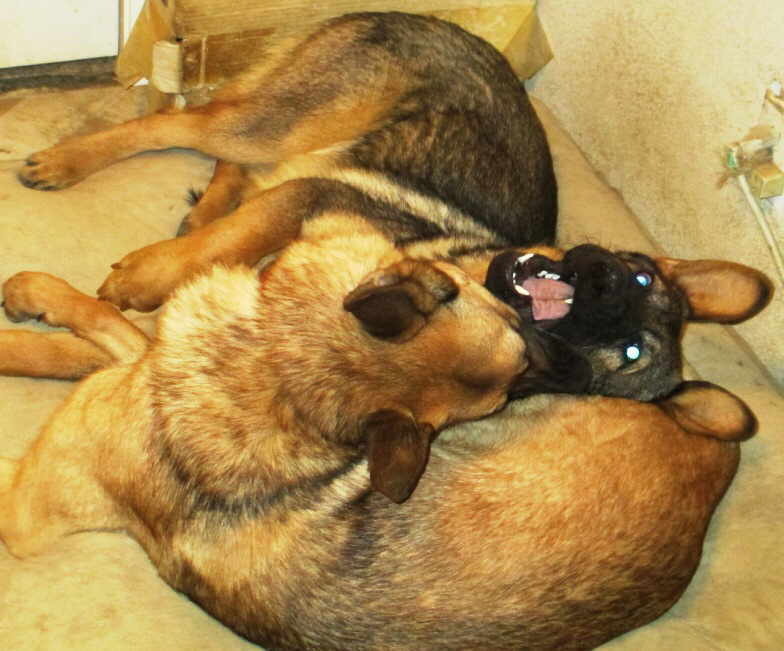 For further information about these dogs, please call Brian Foran at 916-655-3125 or e-mail him at bab43@msn.com. (Note: dogs that were recently adopted will be moved to the very bottom of this page and will have an "Adopted" banner above their profiles.) For information about the adoption process and fees, please see How to Adopt a Dog from GSRSV/Adoption Fees. What is a "Program Dog?" 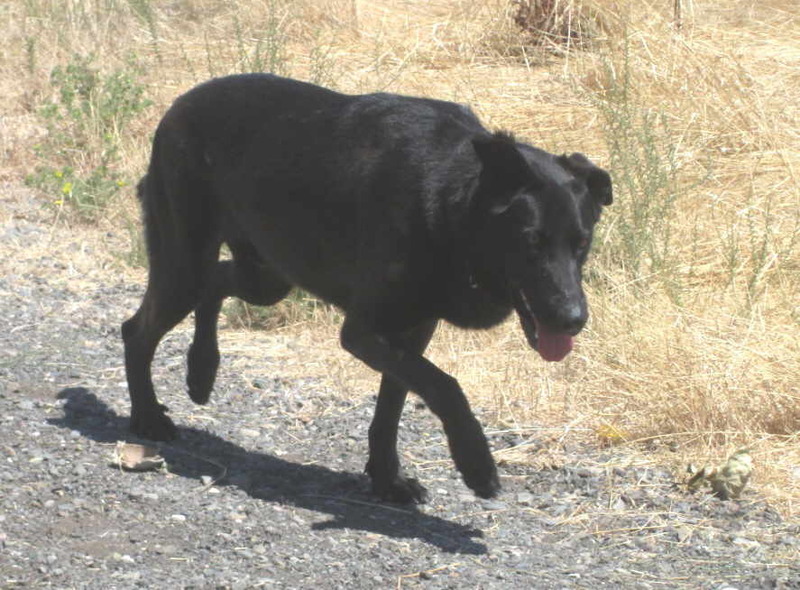 Some dogs' descriptions state that "GSRSV has evaluated [name] and is placing [him or her[ as a Program Dog." This means that the dog is still in the custody of its guardian, but that GSRSV is placing the dog through its adoption program. The same adoption process and adoption fee apply to these dogs as to those in GSRSV's custody, and the same 2-week money-back period and lifetime take-back policy also apply. This picture appears next to dogs that have proven themselves to be cat-friendly. The flag appears above the pictures of dogs that GSRSV is placing for military families who are forced to find new homes for their dogs due to deployments. Please show your support for our service men and women by adopting or fostering their dogs! This page was last modified April 10, 2019. Note: The dogs on this page--other than those added within one week--are listed alphabetically, rather than in chronological order. I list the dogs this way because too many people overlook the dogs that have been listed for awhile, thinking (erroneously) that there must be something wrong with a dog that hasn't been adopted after a few months. This page was last modified 04/10/19. Click for larger image. 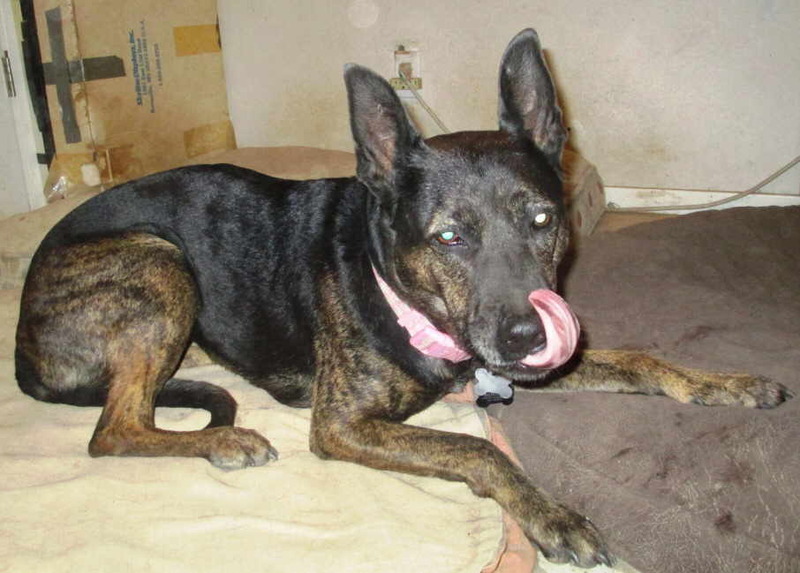 "Rajah" is an approx 7-yo, 50-lb spayed female Pit Bull/GSD who is both zippy and mellow, playful and loyal. Rajah is wonderful around people of all ages--she loves attention and is a real "people dog." She's great with little ones and tolerant of their probing. Rajah is also great with other dogs--she's gentle w/ little dogs and can hold her own with the big dogs. She loves to play and is great at a dog park. Please don't pre-judge Rajah by her dominant breed; though some Pit Bulls can be testy with other dogs, Rajah is definitely NOT a fighter, and if there ever is a skirmish she immediately backs off on verbal rebuke. Rajah would do best in a home with a dog who wants to run and play. Rajah is OK with cats, though she will chase them if they run. 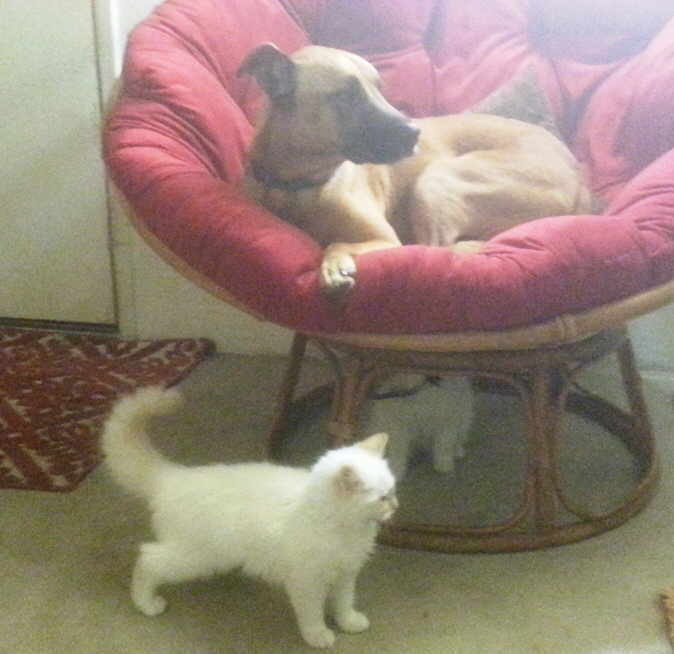 Rajah lives with a few cats in her foster home and has always got along with them--even sleeping on the bed with them. Because Rajah will chase the cats if they run, we recommend only a home with cats that are dog-savvy. Rajah is completely housetrained and non-destructive inside. Like most Pit Bull mixes, she loves to devour toys such as tennis balls, but knows the difference between what she can chew on and what she can't. She loves gnawing on bones, both natural and plastic. Rajah is very well behaved and obeys multiple commands including "sit, lie down, stay, speak, enough, and leave it." Rajah pulls a bit on leash but is non-reactive when she sees other dogs. She is great off-leash with excellent recall. Rajah loves riding in the car and is an excellent passenger. Rajah loves playing fetch and will play for hours. She also loves to swim. She'd be a great dog for an outdoor enthusiast. GSRSV took Rajah in back in March 2016 after her owner passed away. She was adopted in June 2016 by a family with three young children, but they had to return her to GSRSV in April 2017 because they could no longer afford the apartment the were renting. One of GSRSV's regular foster caretakers (Allison) took Rajah in on March 20, 201, and she's been with her ever since. Allison really likes Rajah and I was hoping that she would keep her but she has a few other dogs and finally decided to put her up for adoption. 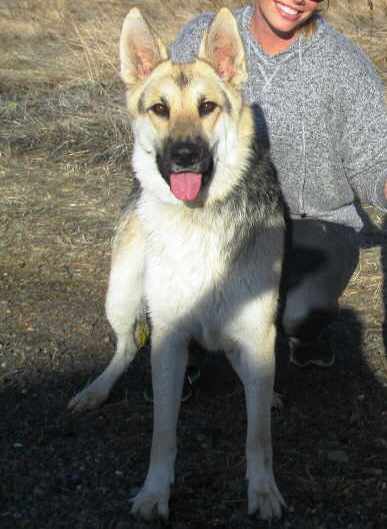 Rajah is located in Rancho Cordova. Her adoption fee is $110. 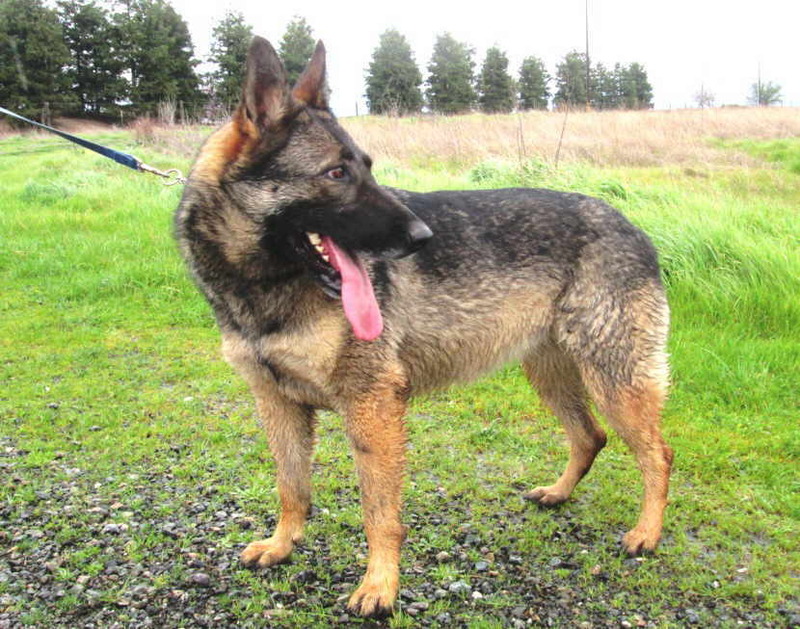 "Athena" is a beautiful, 65-lb, 3-4 yo spayed female GSD who is playful, energetic and devoted. With her sable coat, Athena appears to be a classic East European working-type GSD, and her energy and prey drive certainly back that up. Athena is very friendly with people, including strangers. She is great with children and was fine with a 5-yr old child hugging her. 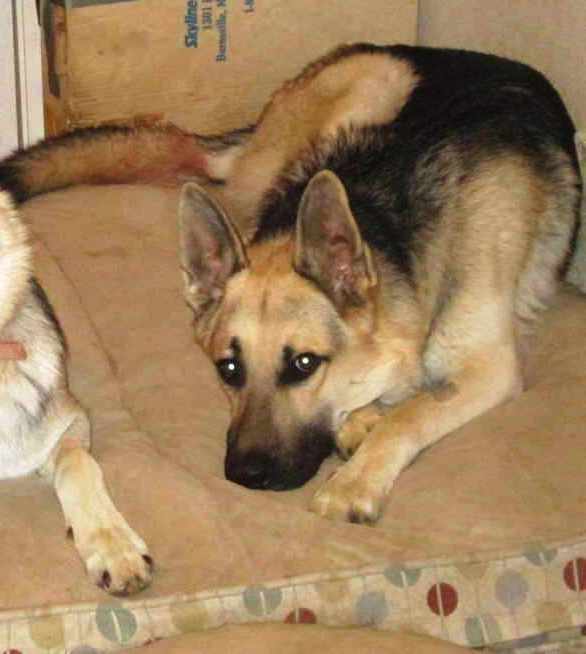 Athena is good with medium and large dogs, and is good buddies with the male GSD she lives with. 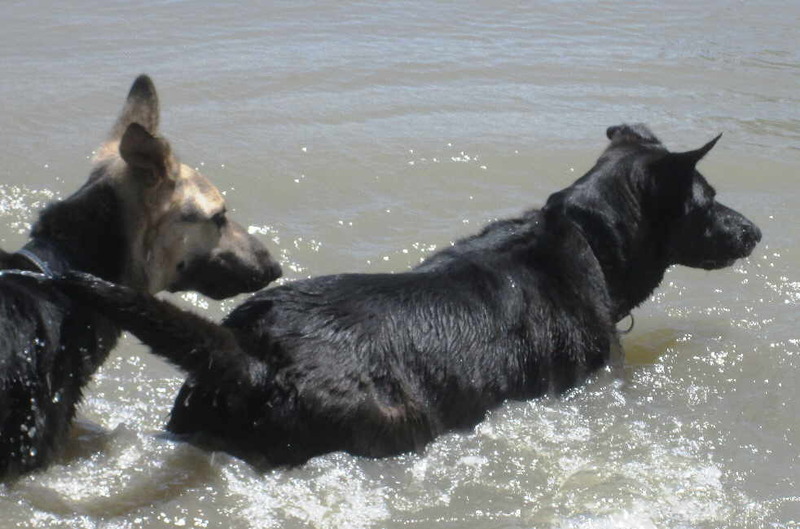 She was great w/ the several GSDs she met at GSRSV's rescue ranch. (Click here for a video of Athena with those dogs.) However, Athena is NOT good with small dogs; she will go after them like they are rabbits. Athena is also not good with cats or livestock. 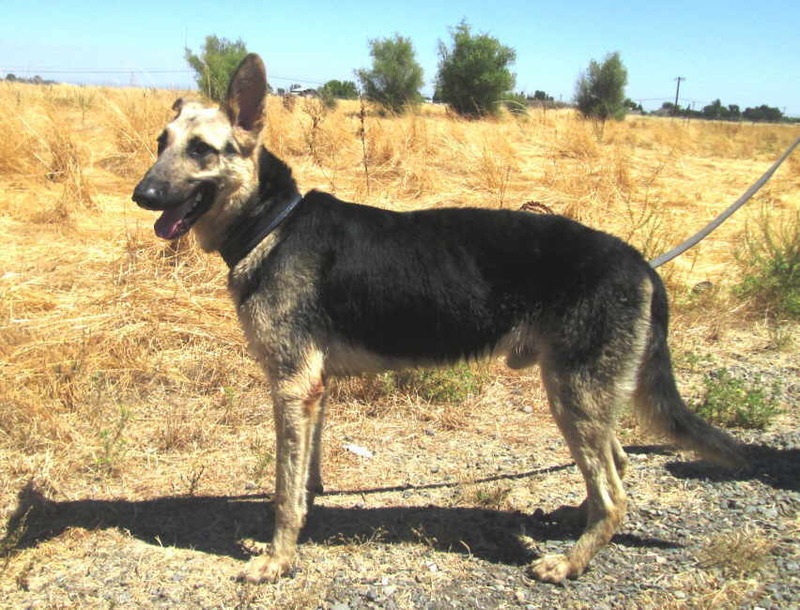 Athena is housetrained, but spends most of her time outside with her male GSD friend. 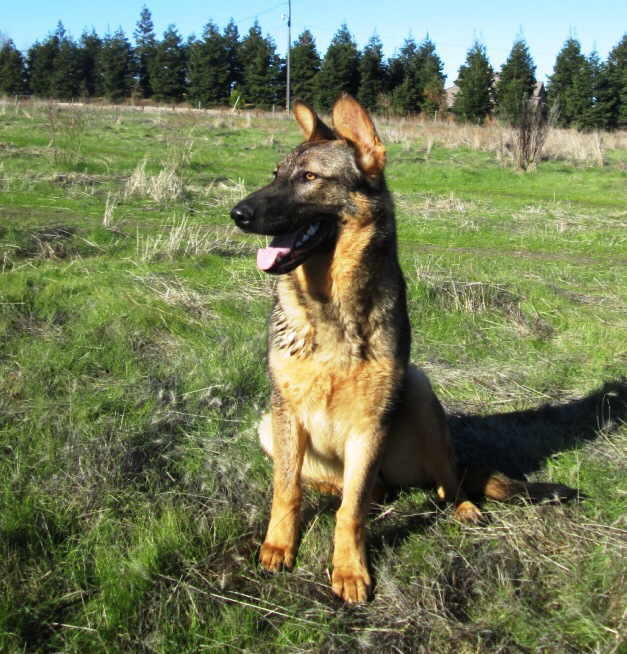 She has received some basic obedience training and responds to basic commands in German. When it's time for walks, Athena does pull strongly at first, but settles down quickly. She is excitable and will jump up on you out of affection if you're not firm with her. Athena loves to play fetch and is good about bringing the ball back. She also loves water and to swim. Athena's owners Glenda & Todd purchased her from a private party in Chico about two years ago. 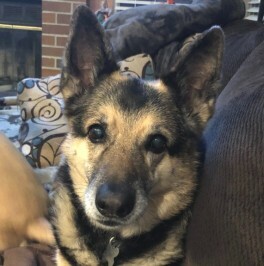 Athena has been a valued member of their family, but they have always had to keep her separate from their little dogs. Recently, Athena was able to get to Glenda's Chihuahua and attacked it (fortunately, the wounds weren't bad). Fearing a similar incident, they've sought GSRSV's assistance in rehoming her. 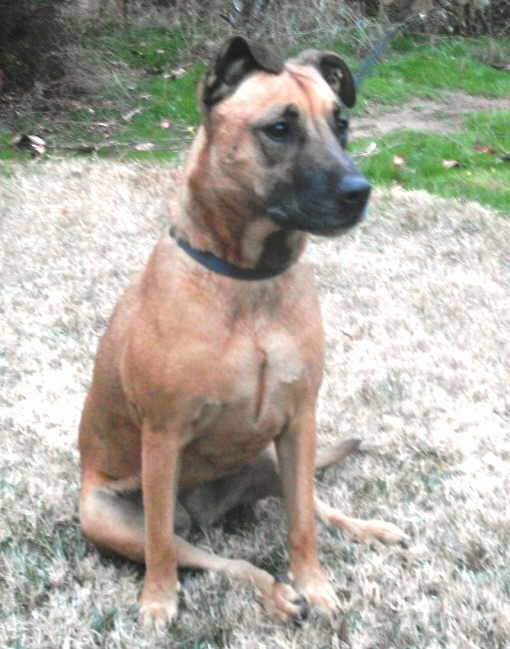 GSRSV has evaluated Athena and is placing her as a "Program Dog." This means that GSRSV is placing Athena through its adoption program while her owners continue to care for her. Athena is located in Oakdale. Her adoption fee is $210. "Blaze" is an approx 66-lb, 1½-yo (born 8-13-17) neutered male GSD mix who is friendly, playful and outgoing. Blaze is 75% GSD & 25% Husky. Blaze is friendly with strangers but alarm-barks appropriately. Blaze loves kids but due to his propensity to jump up on people who don't convey authority, I would recommend a family with no children under 10 yrs of age. Blaze does take treats very gently from hand and has no food-aggression. Blaze is fine with other dogs and grew up with his sister Diamond who he still lives with (see below on this page). I'm not sure how Blaze is with little dogs so I'd be cautious in placing him in a home w/ a little dog. Blaze is definitely not good with cats. Blaze is fully housetrained and has never had an accident in his foster home. He's quite mellow when inside but he often stays outside (he has access via a dog door), probably because he was raised as an outdoor dog primarily. Blaze has not received any formal obedience training, but is fairly obedient nonetheless. He does tend to jump up on people when he first meets them (if they let him), so he'll need a little work in that area. Blaze tends to pull a bit on leash but he does much better when wearing a harness. Blaze hasn't traveled much in a vehicle so is initially timid of getting in. Once inside, he's fine and enjoys the ride. Blaze likes playing with toys--especially tug-of-war with rope toys. Blaze is located in a foster home in Lincoln. His adoption fee is $210. 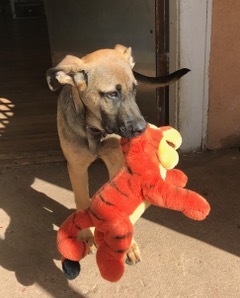 (Chiquita when she was a pup) "Chiquita" is a 1-yo (born 1-2-18), approx 70-lb spayed female GSD/Mastiff mix who is sweet, playful and very smart. Chiquita is immediately friendly with most strangers, but is initially apprehensive with some strangers who come into her house. Chiquita has made friends with every child she's ever met and takes treats gently from hand. She's a large, high-energy dog but is smart and sensitive so will likely tone it down around little tykes. Chiquita loves other dogs and just wants to play, play, play with them--whether it be at a dog park or in her own yard. 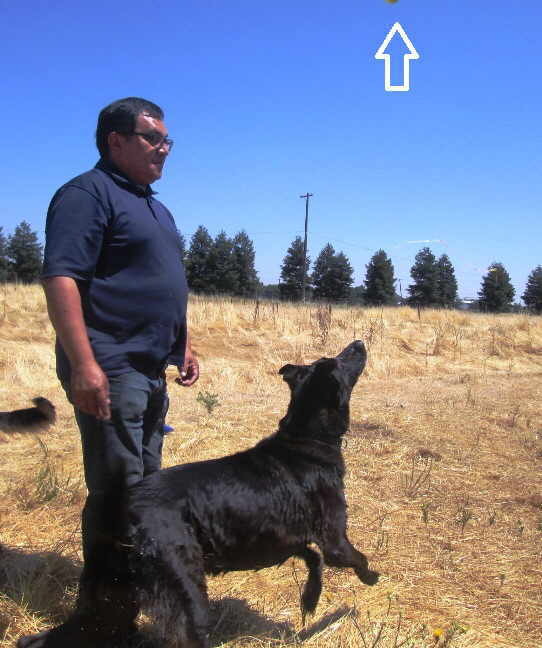 Chiquita did fantastic with the other dogs at GSRSV's rescue ranch--click here for the video. Chiquita is submissive and likes to be chased but does like to play rough so would do best with another young, large, playful dog who is ready to rock 'n roll! A mellow or senior dog would not be a good match for her. Chiquita has chased every cat she's ever seen, so we are seeking a home without cats for her. Chiquita is housetrained and has been since she was two months old. She will sit next to the door or whine when she needs to go outside. Her owner has left her inside for up to three hours and the only thing Chiquita has chewed is her toys and her bones. She also waits patiently when left in the car for short periods. Though friendly with people, Chiquita has already shown the makings of a good watchdog--if she sleeps outside of the bedroom, she will respond to any noise she hears outside by running through the house barking. It's a job she enjoys! Chiquita responds well to numerous commands, and received "Level One" obedience training at Petco. She is a bundle of energy on walks and pulls hard in excitement when she sees other dogs, so she does need work on leash. 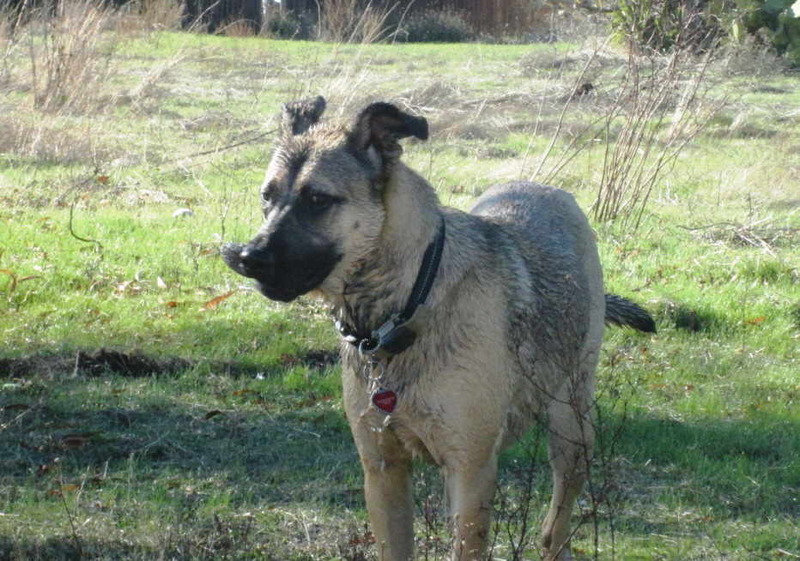 Chiquita likes to play tug, chase sticks and balls (especially into lakes or creeks), fetch, and to wrestle. 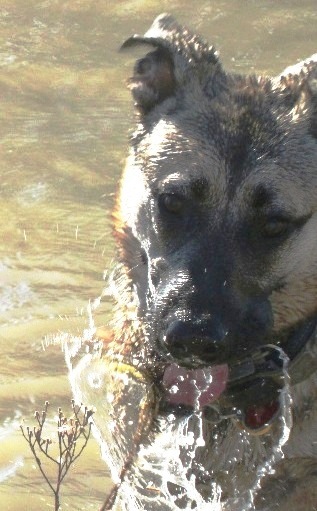 She loves to swim and can play for hours with water coming out of hoses or sprinklers. 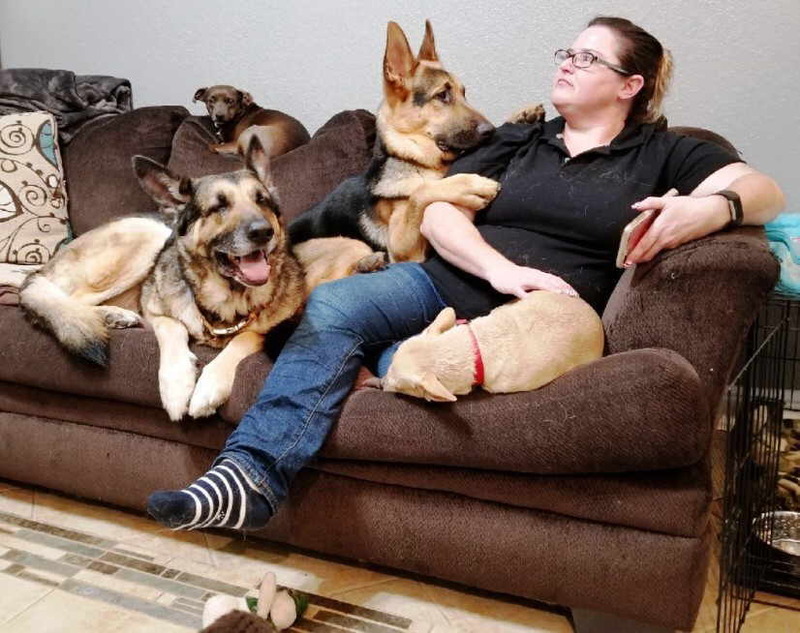 Chiquita's owner Lara obtained Chiquita through Craigslist in March 2018 from an individual whose GSD "accidentally" had puppies. She didn't feel good about the puppies' environment so took one home, intending to foster her until she could find her a permanent home. Lara was unable to find a home for Chiquita on her own, so reached out to GSRSV. I was personally blown away by what a great temperament Chiquita has. She was friendly and outgoing with me from the get-go, and amazing with my dogs. Chiquita is a gem and will make whoever adopts her very happy. Prospective adopters with a canine playmate for Chiquita will be given special consideration! GSRSV has evaluated Chiquita and is placing her as a "Program Dog." This means that GSRSV is placing Chiquita through its adoption program while her owner continues to care for her. Chiquita is located in Sacramento. Her adoption fee is $210. "Diamond" is an approx 60-lb, 1½-yo (born 8-13-17) spayed female GSD mix who is very sweet, playful and at times a little timid. Diamond is 75% GSD, 25% Husky. Diamond loves people and especially children. She was recently adopted by a family with boy 3 & 6 yrs old and for the most part did great with them. However, on the second day in her new home she all of a sudden started barking at the younger boy while he was watching TV. The mother was home and got Diamond to calm down, but the incident scared her and led to her and her husband returning Diamond to GSRSV. I believe that Diamond was simply initiating play the same way she would with another dog, but nonetheless such a tactic is certainly scary for such a young boy and I can hardly blame the couple for returning Diamond. I still feel that Diamond would do great in a home with children, but she probably needs a little more time to learn appropriate behaviors. Diamond is good with other dogs andgrew up with her brother Blaze (see above on this page) who she loves to play with. I'm not sure how Diamond will do with small dogs so I'll be cautious placing her in a home w/ small dogs. Diamond in NOT good with cats. Diamond is completely housetrained and non-destructive inside. Diamond has not received any formal obedience training but does respond well to some basic commands. Diamond walks easy on leash and is non-reactive towards other dogs that she sees. She has fairly good recall off-leash. Diamond rides calmly in a vehicle. Diamond loves to play fetch and tug-of-war with rope toys. 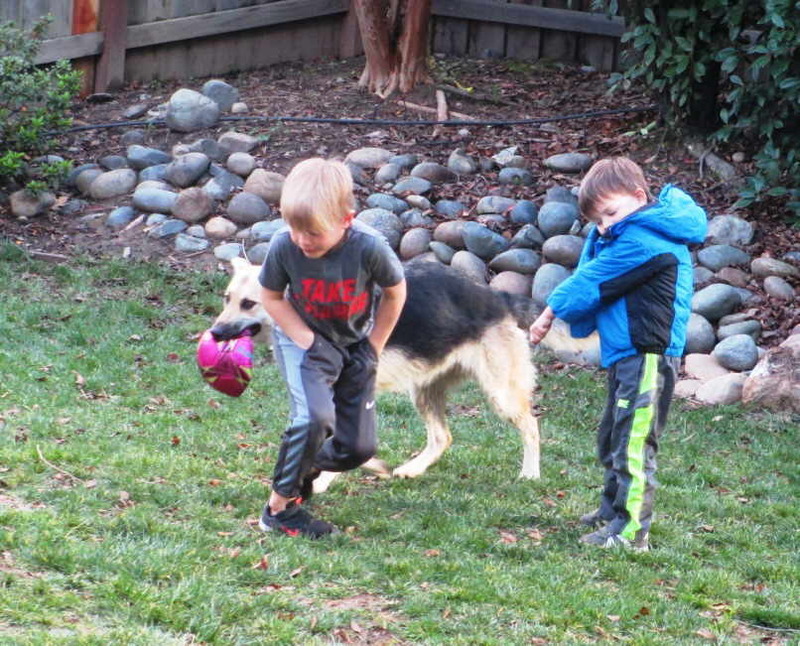 Click here for a video of Diamond chasing a soccer ball with two young boys. Diamond is located in a foster home in Lincoln. Her adoption fee is $210. Click for larger image. 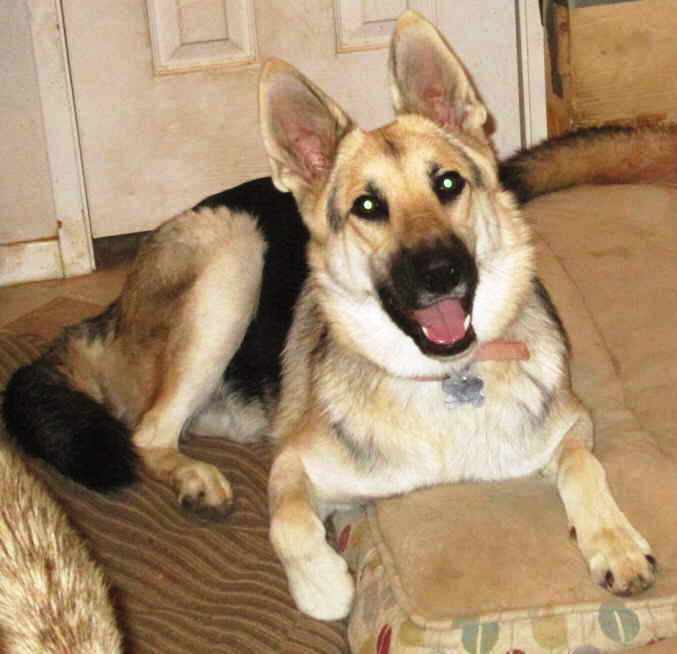 "Lola" is an approx 60-lb, 1-yo soon-to-be spayed female GSD who is super-sweet & playful. Lola is a love bug with everyone she meets; she loves to cuddle. She has the right temperament to be good w/ young children and takes treats gently. However, she will need some supervision with youngsters as she playfully nipped at the feet of two teenage girls in her previous foster home. However, she has not exhibited that behavior at all in her current foster home. Lola is fantastic with other dogs. She loves to play and is always submissive. She will lie on the ground just tempting the other young dogs to "attack her" and will let them chew on her like a rag doll. She almost never gets upset, no matter how rough the other dogs play with her. Ideally, I would like to see Lola go to a home w/ another young, playful dog, but this is not a requirement for adoption. Lola was in a home with two cats for about a week and reportedly did OK w/ them. She did want to chase after them when they ran but backed away when they held their ground. I will consider a home with cats for Lola, but ONLY if there is also a young, playful dog for her to expend her energy on--otherwise I fear she'd drive the cats crazy. Lola is completely housetrained and has never had an accident in any of the three homes she's been in since she was found as a stray. She did chew on the furniture and rugs in her first foster home, but has not chewed anything she shouldn't in her current foster home. 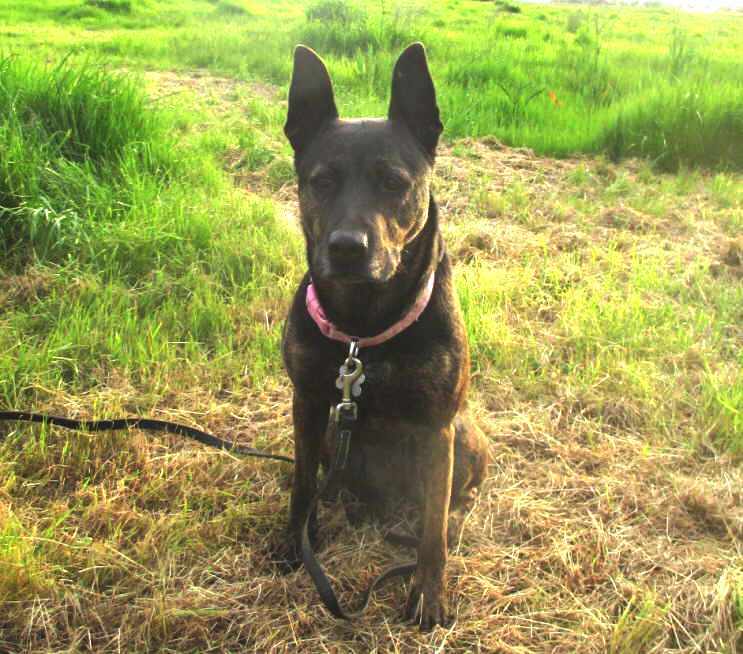 Lola obeys some basic commands and has fairly good off-leash recall. She needs work on-leash but has not had much opportunity to learn leash skills. A man named Ken found Lola in south Sacramento on Dec 24, 2018. He took her home, had her scanned for a microchip (none), notified the County and City shelters and posted online found notices. No owner came forth, and since Ken already had four dogs he was unable to keep Lola. GSRSV took Lola to a foster home on Dec 30 but had to retrieve her on Jan 5 as Lola was trying to dig her way out of the foster caretaker's yard when nobody was home. Lola has yet to be spayed, but will be prior to adoption. Lola is now in another foster home in Sacramento. Her adoption fee is $260. 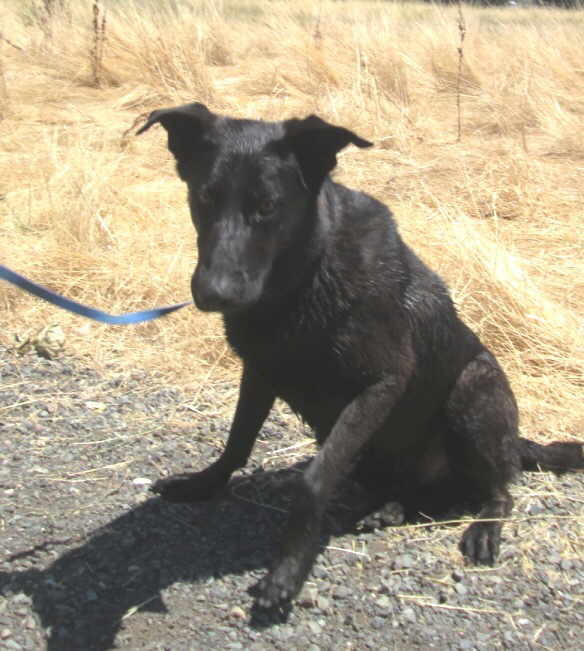 "Rio" is a 4¾-yo (born late June 2014), large (approx 80 lbs) neutered male Black GSD/Labrador Retriever who is friendly, incredibly ball-driven and hyperactive. Rio in NOT your usual mellow Lab who will fit into most any home. 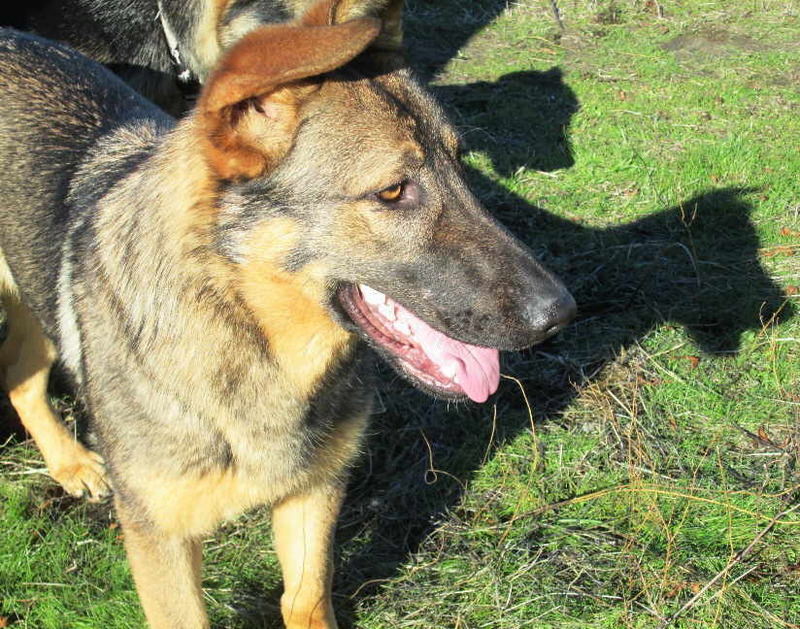 Rio IS a working dog who would absolutely excel at tracking, search & rescue work, and similar endeavors. He is also crazy about playing fetch and will keep at it for hours if you have the patience. Like most Labs, Rio loves all things water. Rio is comfortable with people of all ages, whether on his own turf or out for walks. He's been good with very young kids but he’s as strong as an ox and could easily knock over a small child (indeed, an adult), especially if the child were to throw something for Rio to fetch. Rio is fine with other dogs and likes to run and rough-house with them. However, he’s extremely vocal when playing so if barking might be an issue where you live, Rio is not the dog for you. 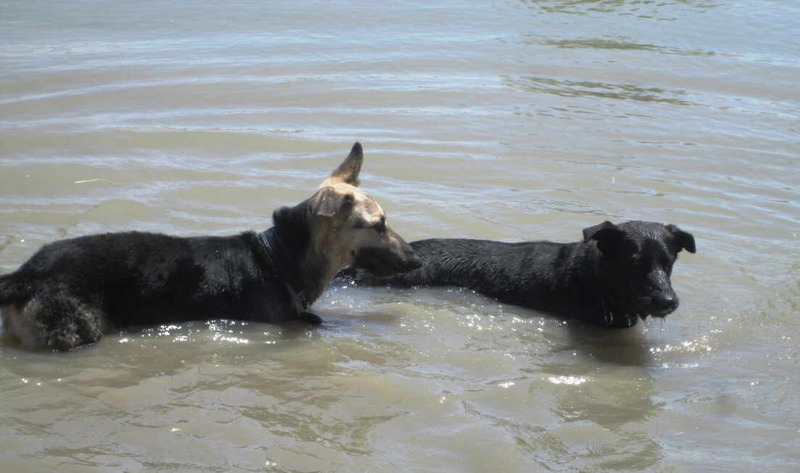 With other dogs, Rio has more of the submissive Lab personality than typical GSD personality and by far prefers to play fetch than play with other dogs. Rio has never been around cats, but in spite of his hyperactiveness, he's a gentle soul. My gut feeling is that he would be OK w/ a cat, so I will consider a home w/ a cat or cats that have been around big dogs before. Rio's former owners kept him as an outdoor dog his entire life with them. Once I took Rio in from his owner last year, I immediately allowed him full access to the house. However, Rio had a persistent habit of peeing on objects in the house and nothing I tried was able to break him of the habit. Finally, I had to resort to keeping him outside or in a crate when inside. Rio does fine in the crate. Rio received some initial training as a 3-mos old pup at Petco. The training lasted for about 3 months but his owners didn't put in enough time with his follow-up training at home. They found it difficult to control him on walks, to keep him from jumping on them and other people, and to prevent him from scratching the screens outside their house windows. (Clearly he wanted to be inside with them!) So, they gave up on training him at home and on his walks too soon. Rio pulls rather strongly on leash, so he needs a person who is both strong and willing to work with him on his leash skills. Rio rides fine in a vehicle and enjoys going for rides. Rio's owners purchased him as a very young puppy (approx 4-5 wks old). Though Rio's male owner Edwin spent lots of time playing with and walking Rio, his wife and daughter were unable to handle Rio's size and energy. In early 2018 Rio's owners had their backyard redone and didn’t want to risk Rio digging up the landscaping. So, they resorted to keeping him on a cable. I met Rio on July 5 and tried to find him a home while he was still with his owners. 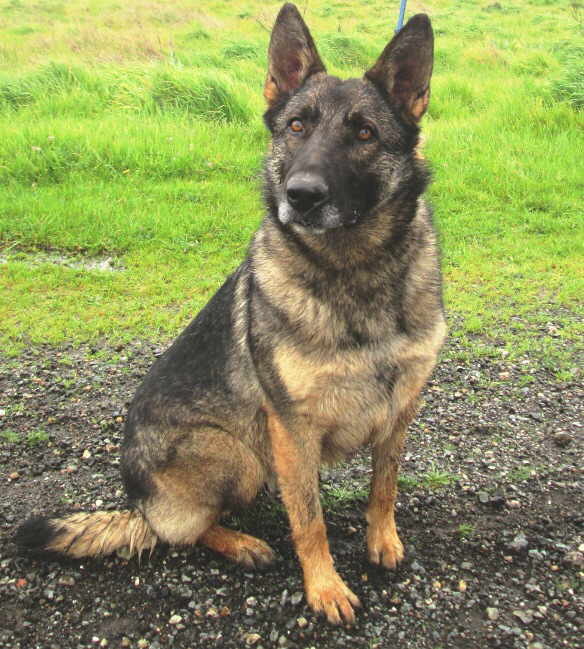 With no luck rehoming Rio, his owners were planning to take him to the SPCA on August 10. I knew that Rio would not do well in the confinement of a shelter and would be too much dog for most people, so I took him in on August 9. Rio’s adoption fee is $210. 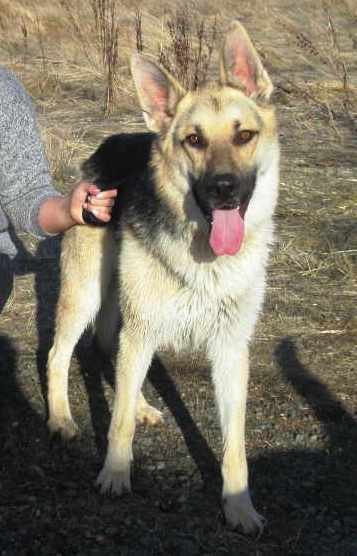 "Snoopy" is a 70-lb, 1-yo neutered male GSD mix who is happy, loveable and a little goofy. Snoopy is friendly with everyone he meets but will likely be a good watchdog as well. I KNOW that Snoopy will be great with young children; he met two kids (ages 8 & 10) and was literally melting in their arms. Snoopy is very affectionate and loves to snuggle right next to you in bed. Snoopy gets along fine with other dogs, but he does have a prey drive and doesn't seem to know what a little dog is; therefore, I am seeking a home with no small dogs. (I'm confident that once he realized that little dogs are indeed dogs, he'd be fine with them.) Snoopy prefers to receive attention from humans much more so than from other dogs, so he'd be fine as an only dog. I have not seen Snoopy around cats, but since he went after a Chihuahua mix, I can't consider a home with cats for him. Snoopy is housetrained and never had an accident in the house he's in, but he does occasionally get his paws up on the counter if there is food present. He responds well to the "sit" and "lie down" commands, so apparently he's received some obedience training in his young life. Snoopy walks very well on leash and rides calmly in a vehicle. 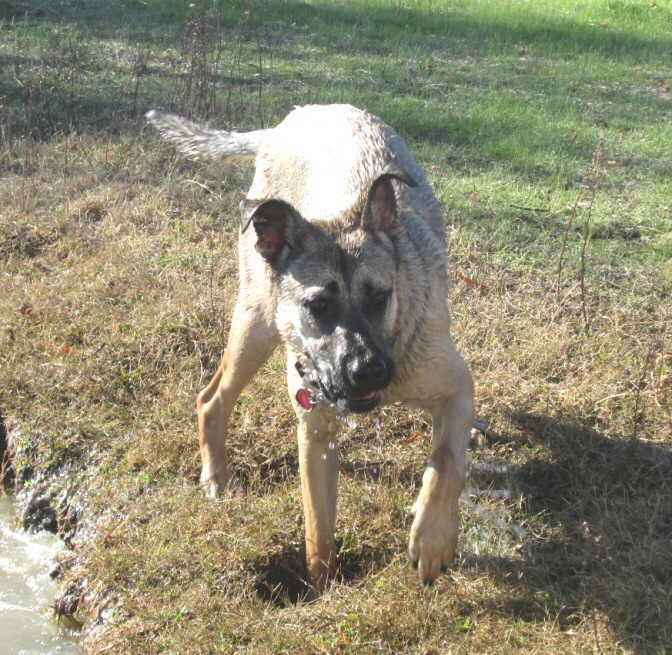 He apparently enjoys water, as he took to the pond at GSRSV's rescue ranch fairly quickly. Snoopy gets his name from his long snout and the somewhat comical overbite in his muzzle. I'm not sure if his overbite originates from another canine breed (Collie?) but it does not affect his ability to eat normally. GSRSV rescued Snoopy from the Stanislaus County Shelter on 6-23-18. He had been at the shelter since May 12; I imagine that he was a staff favorite at the shelter. Nonetheless, his time had run out and he was going to be euthanized so GSRSV appealed for donations to board Snoopy until he could be transferred to a no-kill shelter out of state. Three women came forward with donations to cover his boarding expense. (Thank you Danielle Blount, Diana Cheung and Alicia Navarro!) When I discovered what a sweet dog Snoopy is, I searched for and was able to find a foster home for him so that he wouldn't have to go back to a shelter. Snoopy is located in Sacramento. His adoption fee is $210. "Zoe" is a loveable, energetic, 60 lb 5-yo spayed female Terrier/GSD mix with lots of personality. Zoe is friendly with strangers, but is also a good watchdog. (She barks at people who enter the home, but does not approach them aggressively.) 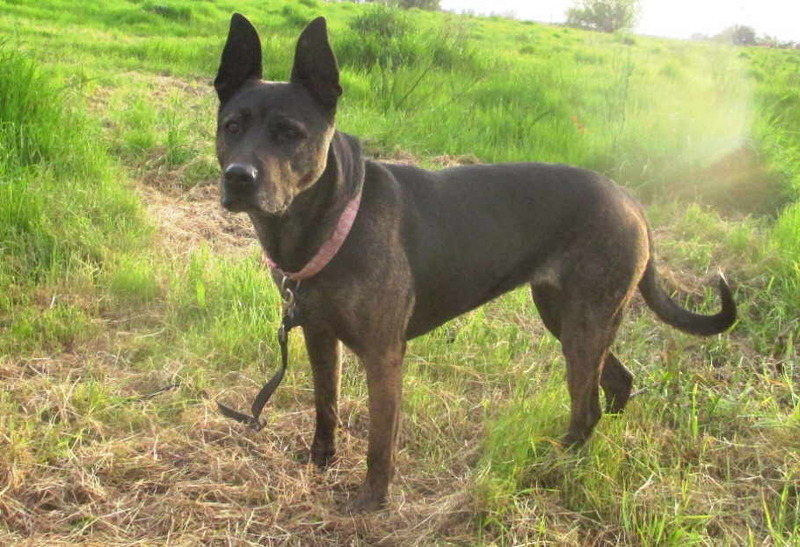 Zoe is fine with children, but nervous around toddlers, so no kids under 4 yrs for Zoe. Zoe is great with other dogs for the most part, but can be somewhat bossy with alpha female dogs, so it's best that Zoe be paired with a male dog. She is presently living with a male Pit Bull mix that she plays with constantly--and plays hard! Zoe is good with small dogs and spent a good amount of time in the same house as a small dog who she let boss her around. Zoe is good at the dog park. Contrary to Zoe's previous Web profile, she is OK with cats! She was in a foster home with cats for three weeks early 2016 while she was recovering from knee surgery, and her foster caretaker at the time often had Zoe around her cats without a problem. Now, Zoe is back at her regular foster home, where Zoe does fine around the two resident cats when they are inside. Once the cats go outside, it’s a different story: Zoe will corner them and bark at them, though that is the extent of her harassment. Regina, Zoe's foster caretaker, thinks she would do fine with a dog savvy indoor cat. Though Zoe might be somewhat annoying to a cat, she has given us no reason to believe that she'd hurt one. On the other hand, Zoe does has a very strong prey drive and loves to chase after squirrels, birds, and other outdoor critters. Zoe is great in the house and exhibits no separation anxiety when left alone. (She was previously an only dog in an apartment, in which she was left for several hours each day by herself.) She is fine on leash, but does pull hard when she sees a cat or squirrel. Zoe is a quick learner and obeys numerous commands. She is even trained to relieve herself on command! She has good recall off-leash, unless she's spotted a small critter to chase. GSRSV originally rescued Zoe in April 2012 from a woman who could no longer keep her due to a forced move from her home. Zoe was adopted by a young couple in Nov 2013. The couple had to return Zoe in Nov 2015 due to a death in the family and a subsequent move into the house of one of the parents. 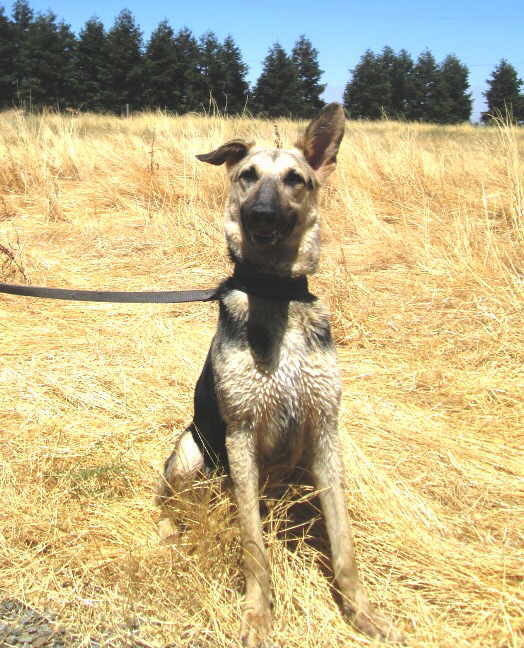 Zoe is presently in a foster home in East Sacramento. Her adoption fee is $175, which includes a microchip. 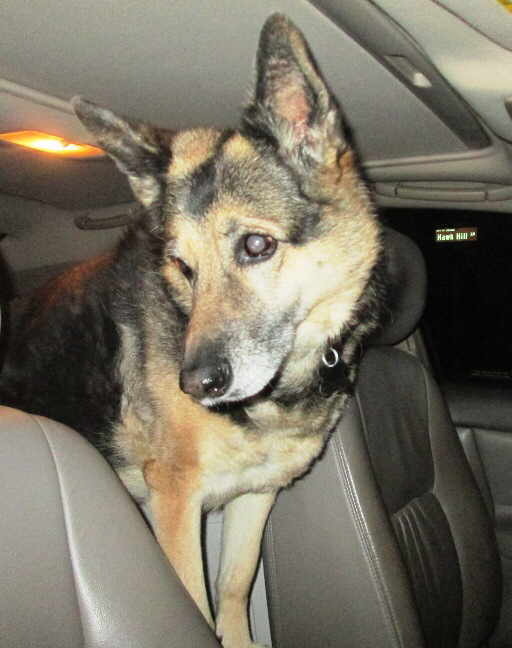 "Lady" is an 11-yo spayed female GSD mix who is as sweet and docile as a GSD can be. 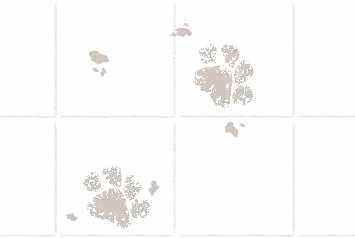 She's in great shape for her age; she can jump unassisted into the back of my 2-wheel drive standard pick-up and she just had an exam with a full blood panel on 1-14-19. The doctor said Lady's blood panel looked excellent! 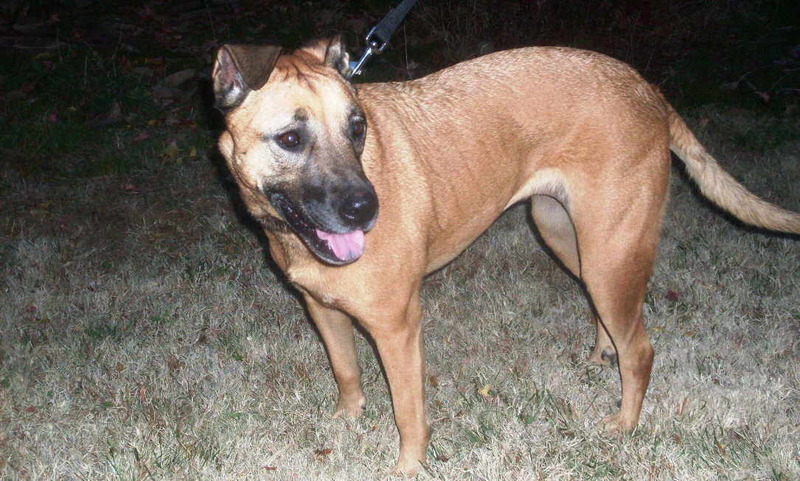 Lady is friendly with all people (though initially a little aloof), and fine with young children. Click here for a video of Lady playing "handsies" with one of her foster caretakers. Lady is great with other dogs. She presently lives with five other dogs in her foster home. Lady is also fine with cats. She presently lives with two in her foster home. Lady is fully housetrained and very quiet. She's loving but not too needy. Lady's owner Cindy Dorovi passed away approx December 20. Cindy, who was 80 yrs old when she died, contacted me a few years ago asking if I would take Lady if she died before she did. I said yes, and sure enough that situation came to pass. Cindy lived alone, so I would visit her on occasion to keep her (and myself) company and to do some work around her house. We became very good friends and I would bring three of my dogs over to her house each time I visited to socialize with Lady & Honey. Of course, I got to know both dogs pretty well. After Cindy died I brought both Lady and her 6-yo spayed female Chihuahua/Dachshund companion "Honey" (see bottom pic at left) to a foster home in Lincoln. On Jan 5, I brought them both to a new foster home where they are presently living with three other dogs and two cats. Lady is located in South Sacramento. Her adoption fee is $85.